What the Hell is Phasing and what does it mean to us! You will hear alot of talk about phasing in the coming weeks with the pattern change in full effect. First of all, what is Phasing? Basically, in simple terms, Phasing is when two low pressure systems combine into one low pressure system. 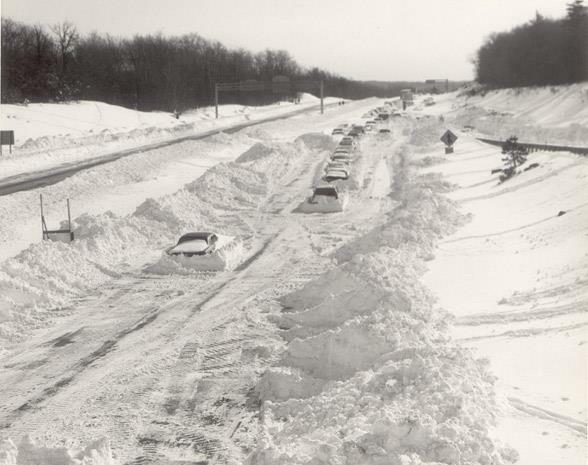 Lows that combine can be stronger and more intense creating more dangerous winter conditions this time of year. 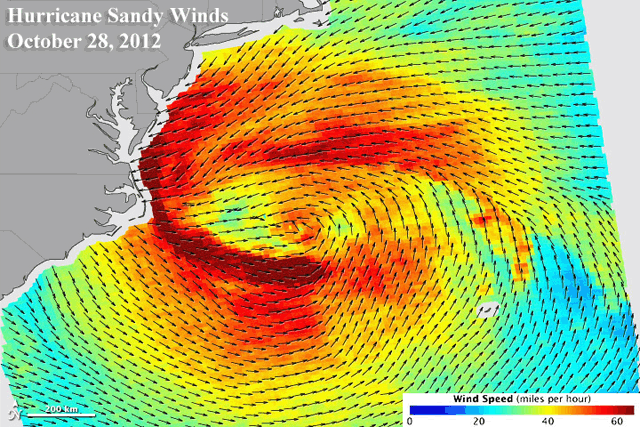 One excellent example of a recent Major Phasing event would be Sandy. We all know what the end result was. While some notable Doctors instantly put language in their blogs such as " we also must acknowledge that climate change could have played a role " while describing why such a storm could happen. There is no evidence what so ever that immediately support this. What we do know, there were a series of meteorological events that took place. I was following a number of NWS Chats days before impact in the N.E discussing the potential major phasing of Sandy and the potential impacts that such an event would have. This was one post, two (2) days before landfall that was very accurate. Two of the major players in the potential event will be the blocking in the Atlantic as well as the positioning of the ridge out west. The 12z GFS, despite a different handling of the ULL near Newfoundland, shows the blocking in the higher latitudes very well. Pretty impressive, even for October, all potential phasing systems aside. 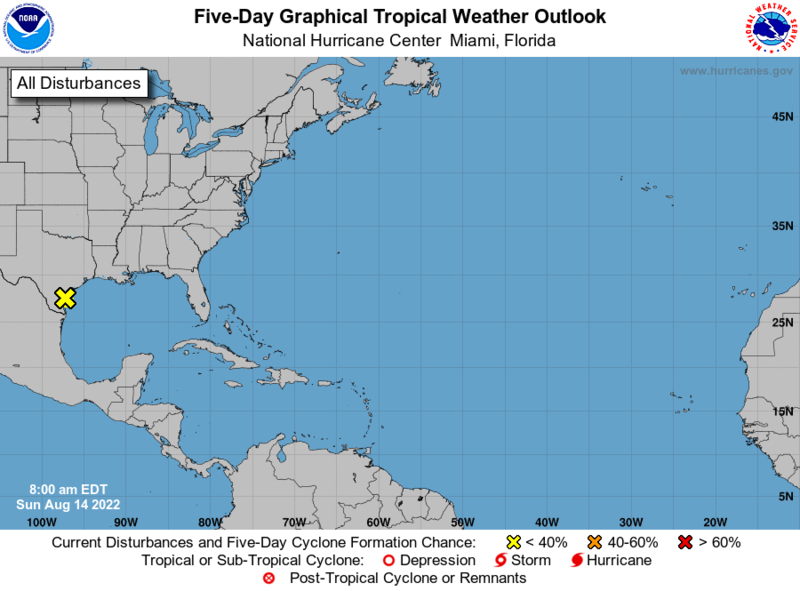 Notice the area of Low Pressure along the coast of North and South Carolina. This the the area that got phased into Sandy. This was 192 hours out. OK, you all get the picture on what phasing is. It happens alot during the Winter Storm Season as Nor-Easters move up the coast and react to other ripples or troughs of low pressure that are moving across the country. This is why a lot of these storms blow up as they move to the North. Now, lets look at the current scenario. While things will be relatively quite for the next ten days or so, we will see little events take place. Looks for things to pick up in the January 12 to 14th time frame. As i mentioned a couple of days ago the stratosphere has been warming for several days. It takes time for the effects of such warming to rear it's head at the surface. But it is coming. A total dislodging or destruction of the stratospheric PV is better to relocate cold from the higher latitudes to the lower latitudes. However..there is alot that has to happen for the Arctic cold to be relocated southward. Mainly..the warming has to work its way down to the troposphere and that means anticyclonic flow becoming stacked or more organized through the various levels of the atmosphere. The +AO/NAO signal that we are seeing is in response to the 500mb vortex relocating itself around Baffin island. 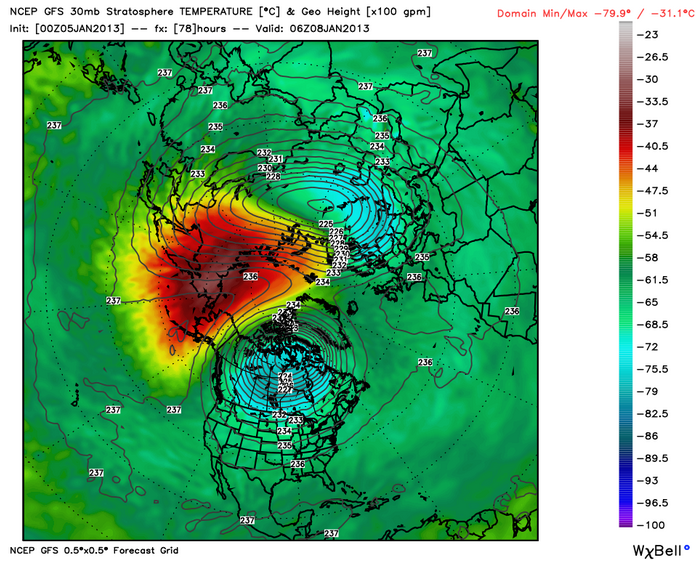 The 500mb Baffin island vortex could be in response to the warming seen in the stratosphere. 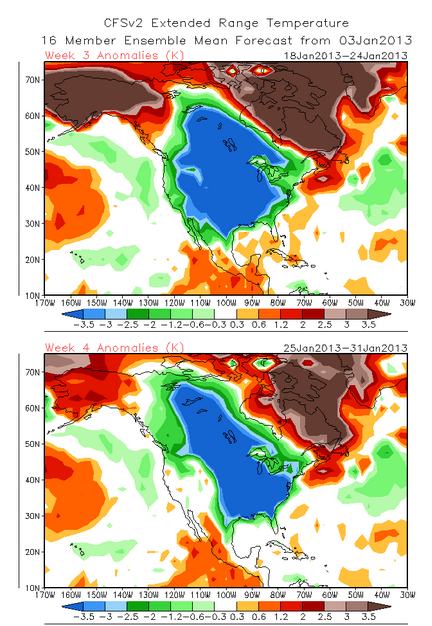 If this is the case, like is being indicated, its going to get brutally cold after the second week in Jan! The CFSv2 ensemble mean shows a warmup occuring during the first half of January but it also shows the Arctic air gates are wide open the second half January! If one looks close enough one can see the dual blocking signals of negative EPO and negative NAO/AO with the warmth centered on the Gulf of Alaska and the Baffin island/Greenalnd area due to blocks in the polar jet stream at those particular locations. MOVING NORTHEAST INTO THE TENNESSEE VALLEY SATURDAY NIGHT AND SUNDAY. 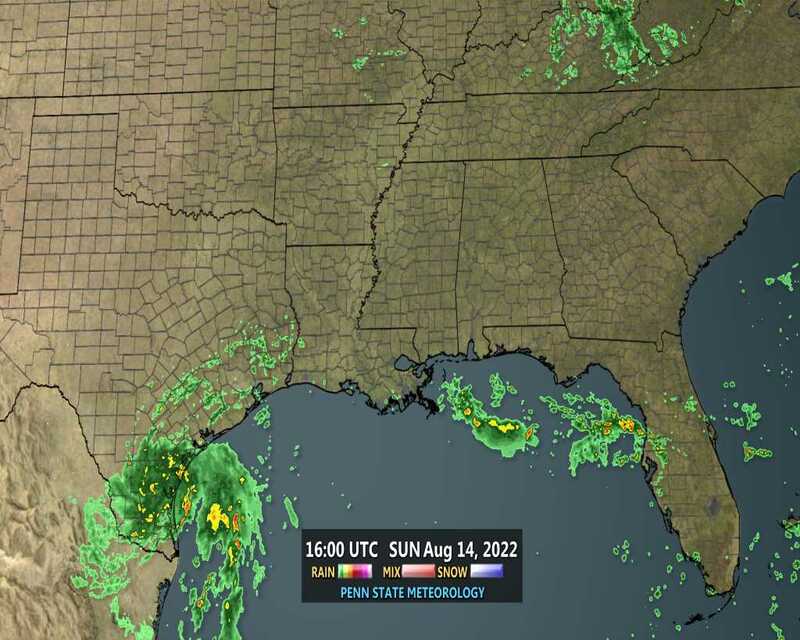 QPF. LATER SHIFTS WILL LIKELY HAVE TO BUMP UP THE POPS. WHICH WILL HELP COOL COLUMN. So stayed tuned for the rest of the winter. You will here the term Phasing a lot, I promise. Re: What the Hell is Phasing and what does it mean to us! 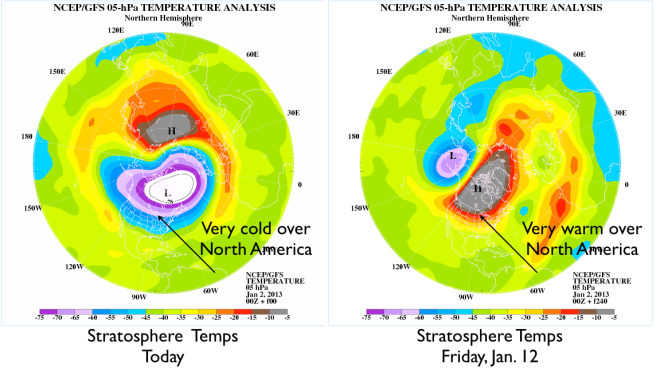 Going back a few days ago in chat in reference to Stratospheric warming, here are the temps today, and the projected temps in 10 days. If you go by climatology, this signal, which has been steadily warming over the past week or so, should bring some bitterly cold weather to the South . How far it moves towards us here is yet to be determined. The stratosphere is a area one would think that is not looked at to predict weather events. The vast majority of the weather that impacts us at the surface occurs in the lowest layer of the atmosphere: the troposphere. The stratosphere is the next layer up, and while storms don’t occur there, research has shown that temperature changes in the stratosphere often signal changes in the troposphere as well. They are opposite each other, though! Warming in the stratosphere can be a clue to significant cooling in the troposphere. In the Mid and Deep South, the next week or so will feature chilly weather with a gradual moderation. 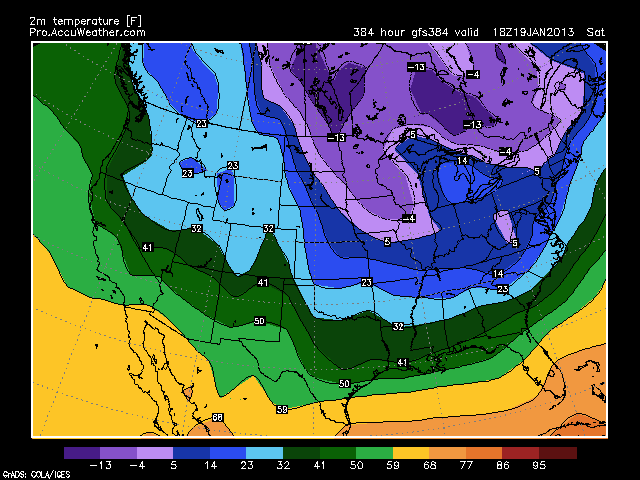 Just beyond the seven day period, a significant flip to very cold weather is possible. The odds are better than 60% that we will see some of the coldest weather since January 2011. As we get closer to the cold period, we will be able to see more clearly if this could actually rival some of the January 2003 or 1994 cold weather when highs were in the 10s and lows were near zero. A big rain event will occur in the South as we make the change to the colder pattern. That rain will come between Thursday, Jan. 10th and Saturday, Jan. 12th. How far South is unknown at the moment. Will have to keep an eye out for the potential of some Severe Weather even tho at the moment, not thinking it will be a big, wide spread issue. 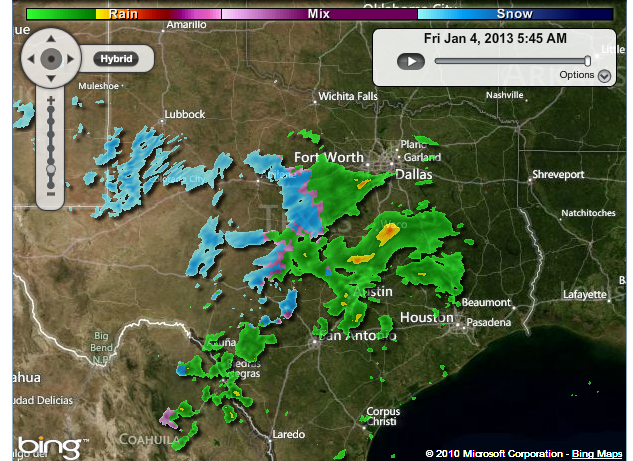 A big Southern Snow? Too early to know for sure, but snow-lovers like me will be glued to the models and observations looking at the pattern between Saturday, Jan. 12th and Tuesday, Jan. 16th. If we’re going to get any (and it’s a big “if”), that looks like about as good a set-up as we could get. It is a long way off. Here is another thing to look for that I forgot to add above. 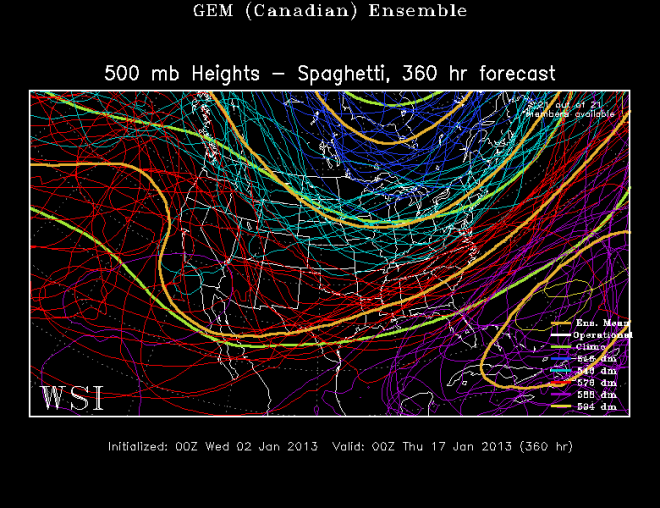 500 millibar spaghetti plot of ensemble forecasts. Each individual set of red, light blue, and dark blue lines indicates a possible position of particular 500 millibar height levels from the various models. The more variation you see in those lines means there is more uncertainty in the forecast. When they start to show more of a pattern, confidence grows that one particular solution is more accurate than the rest. Based on this run of the GFS model (12:00 AM today), there is a lot of uncertainty, but there is increasing consistency in the long-term showing those lines dipping south over the East. That indicates where a future deep trough will set up opening the door for some very cold air. Here is a quick explanation from the University of Illinois of what the 500 mg heights and temperature means to the forecast. The above panel shows 500 mb forecasted fields for geopotential height, temperature and wind vectors. 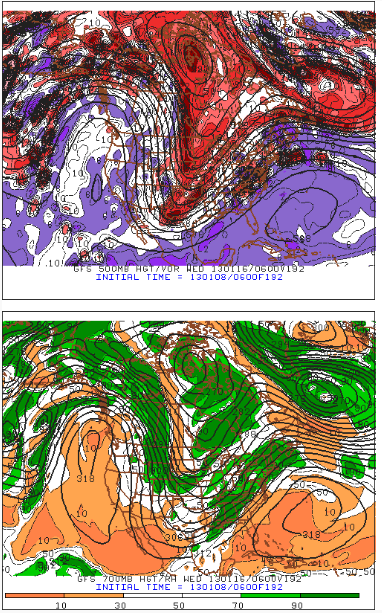 500 mb charts depict conditions in the middle troposphere (roughly 5000 meters). Geopotential height approximates the actual height of a pressure surface above mean sea-level and is represented by the solid white contours. The geopotential height field is given in meters with an interval of 60 meters between height lines. The 500 mb height field encircling the globe consists of a series of troughs and ridges, which are the upper air counterparts of surface cyclones and anticyclones. The distance from trough to trough (or ridge to ridge) is known as the wavelength. Typically waves at 500mb are known as long waves. Embedded within the long waves are short waves, which are smaller disturbances often responsible for triggering surface cyclone development. Wind vectors provide information about wind direction and wind speed and are drawn here as tiny red arrows. Wind vectors point towards the direction in which the wind is blowing and the longer the wind vector, the stronger the wind. The unit of magnitude for wind speed as depicted by the wind vectors is meters per second. Temperature is represented by the color filled regions and the associated values are indicated by the color code located in the lower left corner of the forecast panel. Temperatures are given in degrees Celsius with an interval of 5 degrees Celsius between temperature contours, also called isotherms. In this particular image, the important features are the two closed lows in the western half of the continental United States. 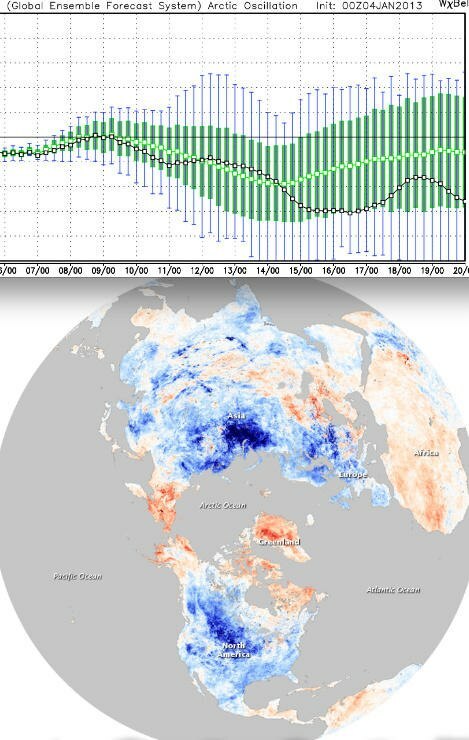 Notice that the temperature is relatively cold in the center of the troughs. These cold temperatures can act to intensify upward motion caused by the troughs. When cold advection occurs into a trough (and warm advection into a ridge), this acts to amplify the wave in the geopotential height field. When the wave is amplified, vertical motions intensify, providing energy for a developing cyclone. Neat little graph Met. Rob Guarino, made. We are gonna start the year with a positive NAO. 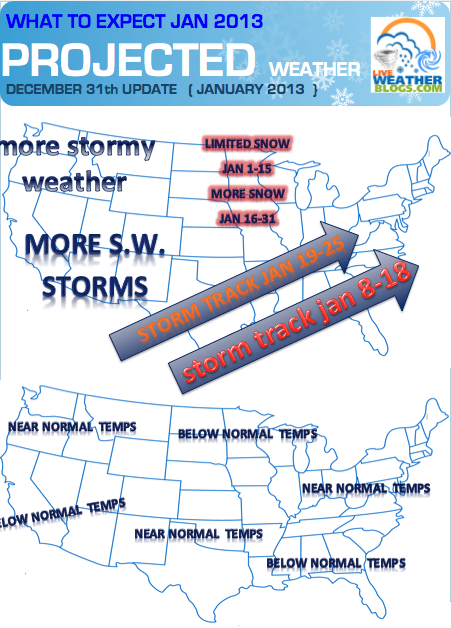 We have a few stormy periods in January but also a few breaks from winter. The overall idea is to watch 1-2 weeks out at a time. The chart above is more like projections based on the ebb and flow of the NAO and AO. The cold air in the east and Midwest will actually slow the stormy pattern down for the first week of January. After that the pattern may try and get a few storm either near the East Coast or come in through the Midwest. 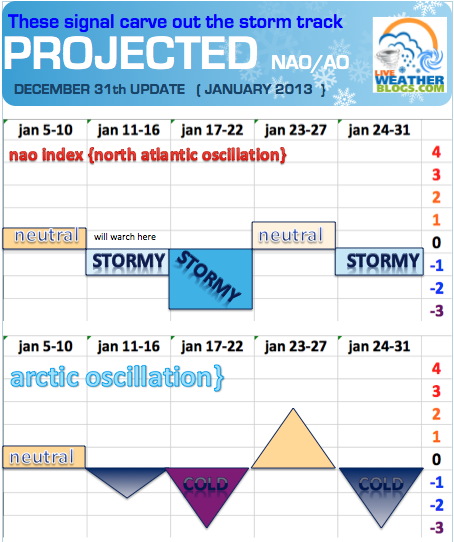 This period has one of change as the NAO and AO start to dip again into a stormy period. Later in the month will feature a few stormy periods but a period of warmth too. I find the later part of the month one of wide swings in the weather esp. 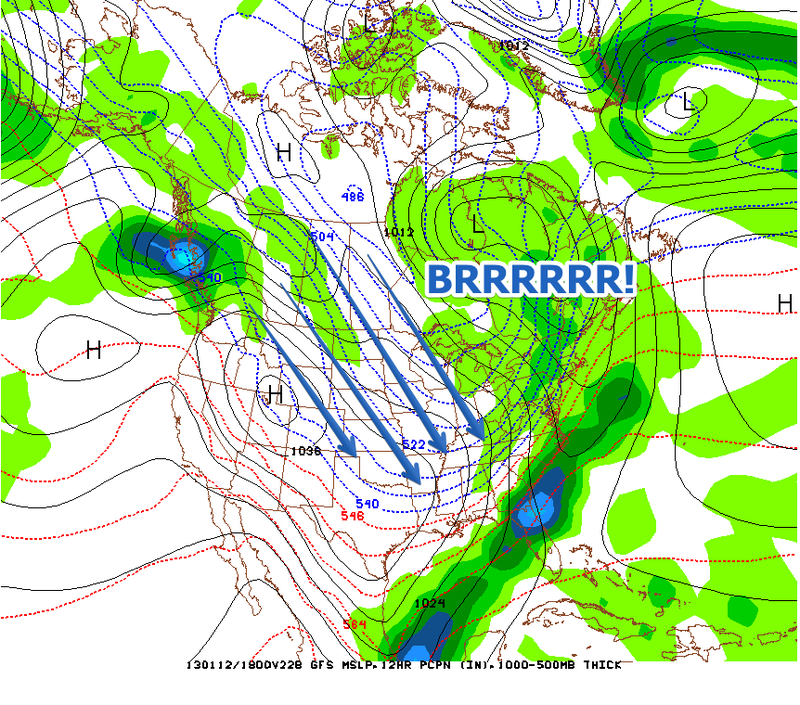 in the south with severe weather...a severe/bliizard outbreak in one storm and colder weather near February. The west coast will continue a parade of storms the next few weeks. Great blog post today, e !! 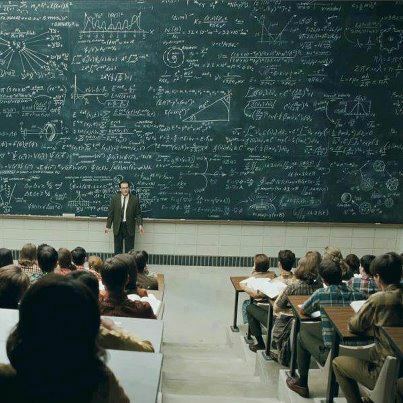 And thanks for posting that link to that other blog.....his explanations are very similar to the way you try to explain things, to us novices!!! Day time highs during the day on the 19th. Brrr! Arctic plunge...then a low forms in the gulf and moves northeast. Can you say major snow storm if that plays out. It appears that a SSW (Sudden Stratospheric Warming event) is under way. What the basic idea is.. Warming in the stratosphere means cooling in the troposphere and it's a disruption of the polar vortex sending it further south. 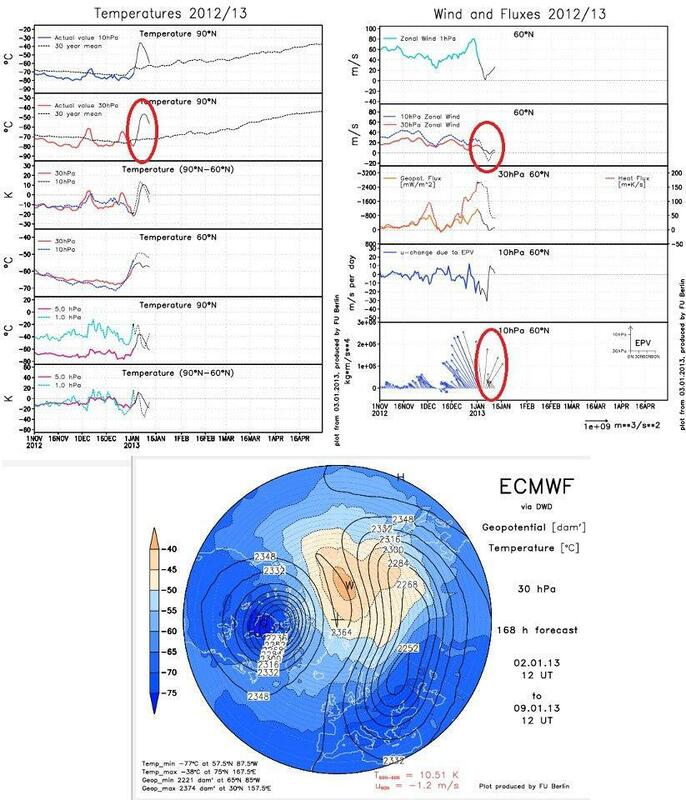 What is it: A sudden stratospheric warming (SSW) is an event where the polar vortex of westerly winds in the winter hemisphere abruptly (i.e. over the course of a few days) slows down or even reverses direction, accompanied by a rise of stratospheric temperature by several tens of kelvins. This is considered to be the most dramatic meteorological event in the stratosphere. It appears the coldest air should arrive Jan 23-Feb. 3 over the Midwest/Northeast towards the back end of this window with several shortwaves passing over the Midwest/Northeast starting with the first one in the Jan 22/23 time frame and then 2 or 3 waves spaced out through Feb 1-2 that will usher in progressively colder air with the coldest arctic air blast again expected to arrive the last week of Jan. 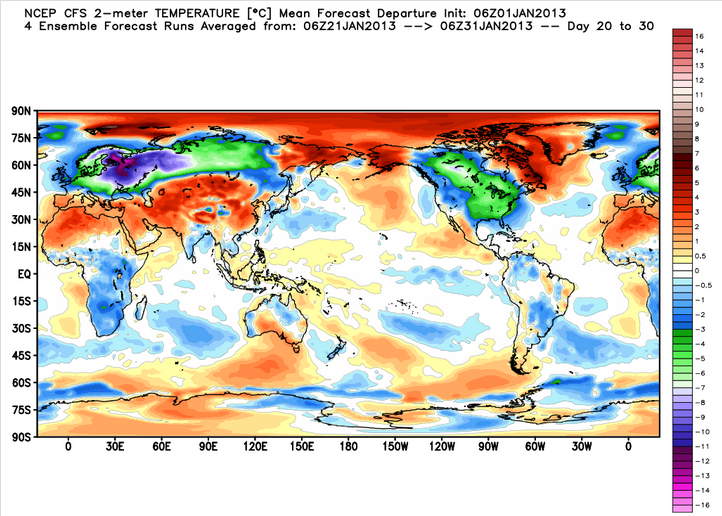 The latest models across the globe are in agreement of Major Arctic Outbreak. This along with imaging the the actual event unfolding. We are talking record breaking cold and what is being shown now is that the USA going into the deep freeze. There will be alot of people fooled as temps in the Eastern and Mid West warm up nicely over the nest week before the cold weather sinks in. This may be some of the the coldest air we have seen in years!!! 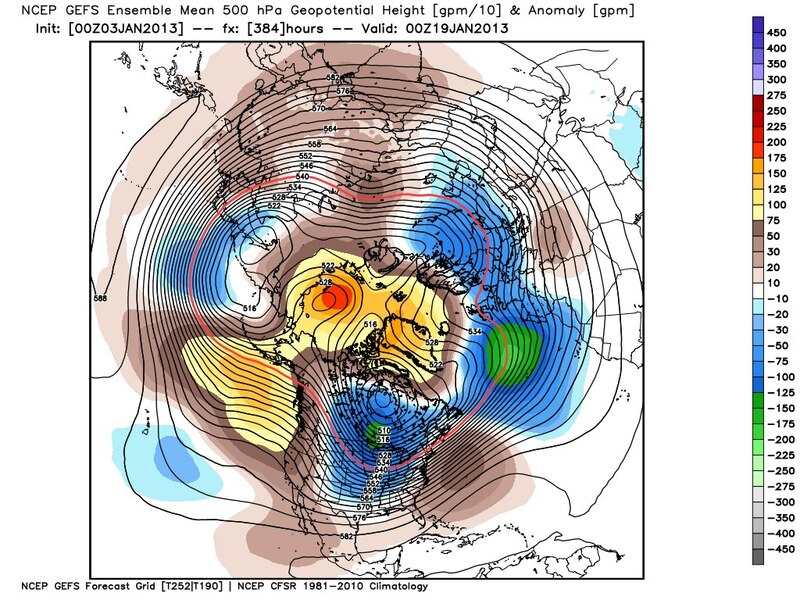 The image below is from the GEFS showing blocking developing over the Pole and the cold plowing South! Damn, Got a response other than from San. I am so excited. LMAO. Any how, your welcome. I like talking to myself. I'm here for ya E, lol. Anyway, thanks for the write ups. I hope this verifies. Kinda reminds me of the 384 hour GFS showing a cat5 at the end of every model run during the hurricane season. Seems there's been hints of bitter cold for the past month but it's never materialized (ie: single digits to below zero for highs across a good chunk of the northern US). Bring the cold! StAugustineFL wrote: I'm here for ya E, lol. Damn e !!! 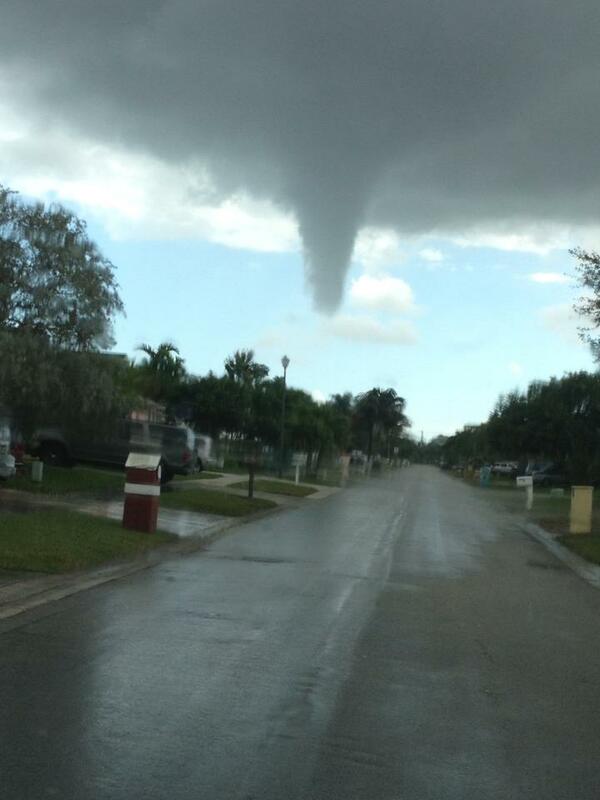 Was that a water spout, that moved inland? I have the F5 key at the ready. Where is everyone? Look at the freezing line in the middle of the afternoon. Me no understand about modify!. All extended range guidance products over the last few days have trended towards a triple blocking (-AO/NAO/EPO) signal as we get closer to the middle of the month. That oscillation alignment would allow the current split flow pattern to continue into Febuary and the pattern would become conducive for major snow storms in the eastern US. Past runs of the CFSv2 reveals a late month and powerful outbreak/intrusion of Arctic air into the majority if not all of the eastern US. 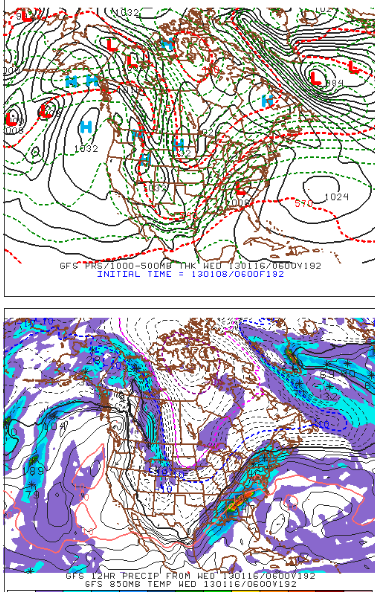 This will also increase the likelyhood of a major snow storm in the eastern US late Jan/early Febuary. In case you havent heard.. the stratospheric polar vortex will likely split into two daughter vorticies early next week. This is a very significant piece of the puzzle that will eventually drive true Arctic air into the conus later this month. sangria wrote: Damn e !!! Was that a water spout, that moved inland? Nope, just a good ole funnel cloud. Don't think there was any damage. Prolly scared the crap out of peeps tho. Here is another shot. 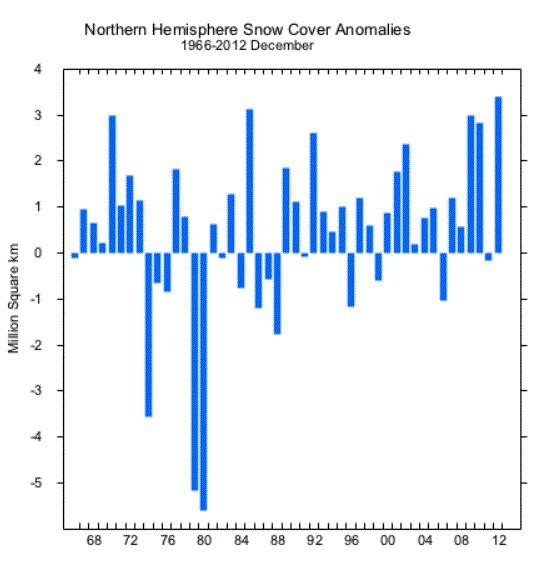 Copertura nevosa nell'Emisfero Nord...Record assoluto per dicembre 2012, 9 milioni di kmq più di 32 anni fa! Uso lo spazio album dell'immagine del profilo della pagina, per mettere tutte le foto particolari, gli scatti + belli, del nostro pianeta, e non...fate la vostra scelta e,,,condividete!!! E, honey, It's time to go back on your meds. Swiss Miss wrote: E, honey, It's time to go back on your meds. I agree E, I agree. Nice video by the WxRisk group. continued engagement with its partners and users about these proposals. Forgive me, I know this is not toy related but. Damn, the GFS sure wants to bring in a major snow event to the Deep South. Check out the huge ridge out west pre truncation 6zGFS. This is exactly what is needed for the cold air to invade the South and you add a closed low and the rest is history. This is the way things are going to look soon.